The Ultimate Warrior (1975) - Sci-fi-central.com.  USA  1975  94m   Directed by: Robert Clouse.  Starring: Yul Brynner, Max von Sydow, Joanna Miles, William Smith, Richard Kelton, Stephen McHattie, Darrell Zwerling, Lane Bradbury, Nate Esformes, Mel Novak, Mickey Caruso, Gary Johnson, Susan Keener.  Music by: Gil Melle. Only a few people still live in New York in 2012. They are organized in gangs with their own turf. One of them is led by Baron, another one by Carrot, and they are constantly at war with each other. Baron's gang is more peaceful and have developed seeds that can germinate despite the virus plague. The lone ranger Carson is hired by Bishop for protection. Because I was on a kick for some post-apocalyptic goodness and the cast included old favorites, I watched this flick. The result is mildly disappointing but might still be worth it for some. One thing that must be taken into account is that we are talking about a 1975 movie. This excuse its clunkiness and the lack of scope somewhat, although not completely. The basic plot is rather vague, all over the place. The writing is crude and ridiculous at times, yet there are worthwhile ideas to explore. The story takes place in a post-apoc New-York circa 2012. The usual staples of the genre are there. Lawlessness in a barren city, return to a semi-primitive life and lots of scavenging. Some survivors form bands. This flick focuses on two such rival groups, one of which, in the pure Hollywood tradition is the "good guys" and the other "the bad guys". Yul Brynner, for a man in his 50s, is surprisingly in shape and exudes action hero charisma. He is effective here as Carson, a super-tough survivor who responds to the (very lame, plot-wise) "good guy's offer" to protect them in exchange for a clean room, triple food rations and most importantly to him... cigars (I kid you not). Max Von Sydow's aura is equally perceptible but as in many, many of his 70s80s movies, he's simply collecting the paycheck here. You'll appreciate his natural screen presence but do not expect to be blown away. He's the leader of the "good band" here but is not use to best effect. His character is very one-dimensional. While the one-dimensionality of Carson works, we expect more emotion from the peripheral characters. William Smith plays Carrot, your usual psychotic main villain and leader of the "bad clan". Surprisingly, he gives the best performance of the entire film by far, even if that's not saying much. The rest of the actors are extremely weak and their characters are flat andor undeveloped. The main flaw of this movie is a failure to establish much motivations. The way leader Baron (Sydow) "recruits" Carson at the start of the movie is beyond ridiculous. The whole setup is just so unbelievable that we expect there is more to it than Carson just standing there in the middle of the city. The two clans are at war but it's difficult to comprehend why exactly. Sure, we get that it's a typical conflict but we never swallow it. But wait, you say. Why does it matter if the characters are fleshed out or not? Isn't this an action flick? There's the problem. There is a real attempt here at telling a story because there is NOT much action. It's just that there is no real story, unfortunately. We spend a lot of time with Baron's bunch. Learning about various characters and the tensions caused by the lack of food but it's all underdeveloped. You get the impression there are directorial comments here about "communal lifestyle" but they aren't clear. There's also a surprising lack of romance here or other kitsch elements. The final act of the flick is a drawn out chase in the subways that is anything but exciting. The final confrontation has nice ideas but again, falls flat. At its heart, I think Ultimate Warrior wanted to highlight the differences and more importantly the similarities between "peaceful hippies" and "hardened men" such as Carson and how the two react when facing obstacles in a lawless environment. Unfortunately, it fails. Everything this movie does, the Mad Max trilogy does way better. Except I'd rather watch Max Von Sydow than Tina Turner. 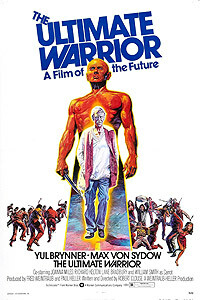 Big fans of post-apoc films, Sydow, Brynner or cheesy 70s flick will want to give this one one viewing and that's it. Review by Siamois from the Internet Movie Database.